With its brushed chrome finish and high quality A.B.S. barrel The Giotto Mechanical Pencil is ideal for promotions where you want to convey classical values to your target audience. It is an excellent choice when the written message may need to be erased or where the click-action of a pen would not be acceptable in environments such as libraries, seminars or training rooms. It is fully compliant with current safety regulations and comes with a 0.7mm diameter HB lead as standard. The Giotto pencil, as with the Ball Pen version operates on a push-button mechanism and a large advertising message or logo can be printed on the periphery of the barrel in up to 6 matched colours. It can be supplied individually with a range of optional presentation packaging or you may wish to consider the Giotto gift-set, comprising Ball Pen and matching Mechanical Pencil for those prestigious promotions. 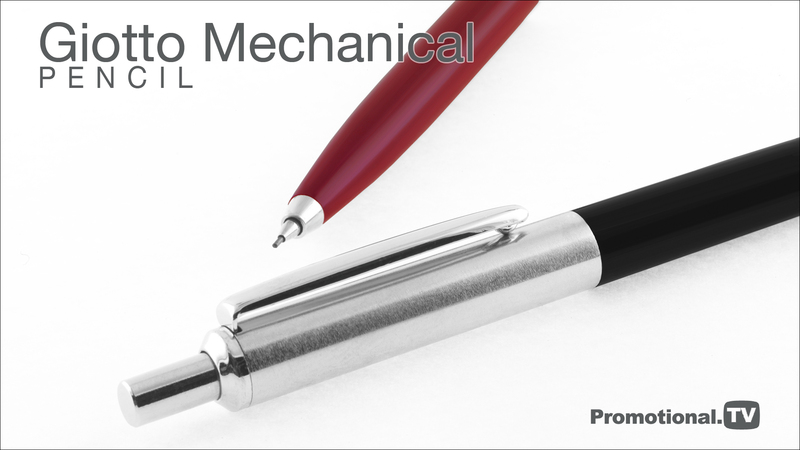 Order the Giotto Mechanical Pencil today and you will receive a Free Gift; just check out the free gifts tab on this page.